There’s no dank IT backroom for GE employees in Albany, New York. If they need help, they head to MyTech Lounge. 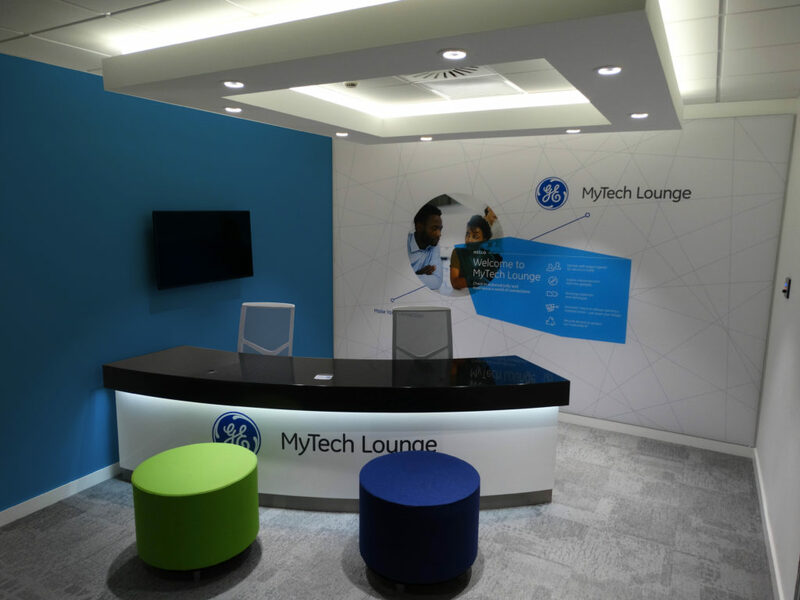 PaulDesignsProject, working with EP&M International designed and fit-up over 50 “MyTech” Lounges for GE in five continents. 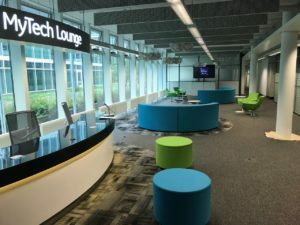 The “MyTech” lounge is a new concept for the IT Help Desk. 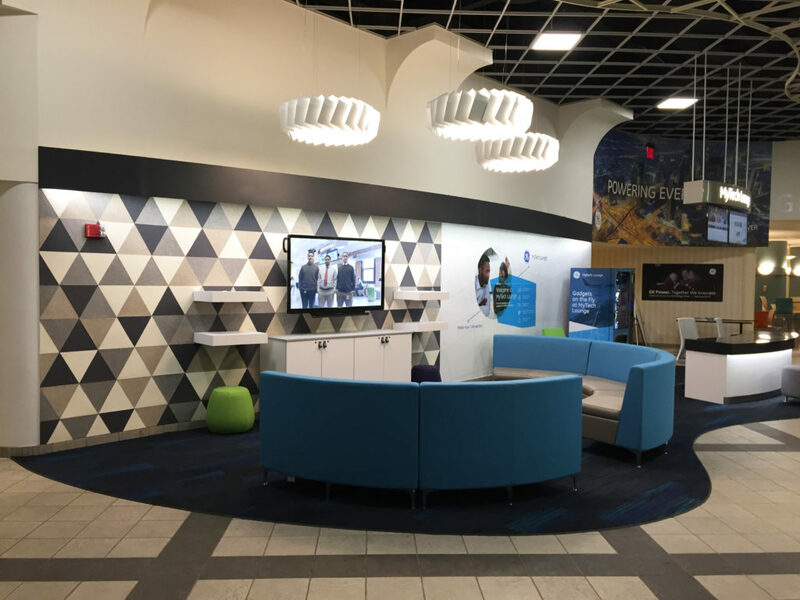 Instead of a service window in a back corridor of the IT department, a third-space style lounge was established with soft seating, bold finishes, and a sophisticated scheduling, tracking and presentation system with software created by EP&M. The core of each lounge was a curved desk with seating on both sides for a more “social” style of IT Help. Some locations featured vending machines or display shelving to showcase available electronic devices and accessories. 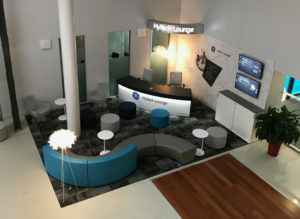 The MyTech Lounge in Germany. After approval of the prototype concept, GE identified at least a dozen locations for each quarter of 2017. EP+M coordinated the procurement, construction and installation for each site. The sites ranged in size from 250 square feet up to almost 3,000 square feet. 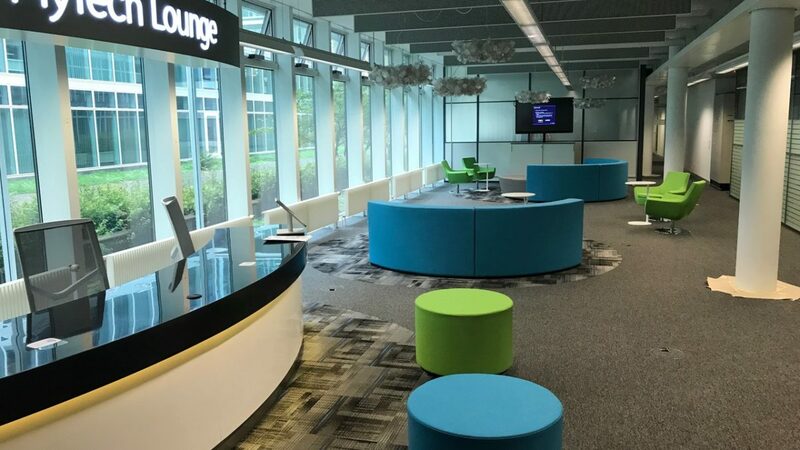 Standards were established in relationship to the size of the lounge – large lounges had more soft seating, smaller lounges would only have a desk, simple seating and signage. Every lounge is anchored by its display screen and “MyTech” software. “We also knew that finding the right furniture dealers and manufacturers would be important,” said Paul Lewandowski, the other half of PaulDesignsProject. “We found some great partners to help.” In North America, PDP and EP+M worked with US-based Kimball Office for furniture, Bentley Mills for flooring and Eureka Lighting out of Montreal, Canada. For Europe, Africa, Asia and Australia, Office Resources, a contract furniture dealer with offices throughout the northeast and New York coordinated with several vendors and manufactures – Holmris Furniture in Copenhagen, Denmark, Koleksiyion Furniture in Istanbul, Turkey and Slamp Lighting in Rome, Italy. Maasland Carpet was able to provide carpeting for non-North American sites through their sister company in France. Starnet Commercial Flooring, through their network, identified dealers and installers in the varied global locations. Since each location was unique and almost all of them located in existing facilities to be renovated, each site had individual challenges. In some locations custom stands for video monitors needed to be designed and fabricated when there weren’t any suitable walls. In other locations, often in lobbies with generous amounts of glazing, digitally printed signage was modified to be applied to glass as a film. If wall conditions weren’t suitable for the custom graphic wall coverings, silicone edge panels were stretched in frames and mounted to the wall. In one location, signage and graphics were achieved through hanging banners. PDP utilized BIM software (Autodesk REVIT) to easily prepare schedules, furniture lists and full documentation for each site. EP&M pre-ordered furniture and warehoused it in multiple locations to facilitate shipping and install of furniture. GE assigned regional project managers in several geographic regions to interface with the design/implementation team. The collaboration between client, designer, project manager, manufacturers, dealers and trade organizations was the secret to the success of this project – over 50 sites designed, procured, installed and put into use in a 12-month timeframe.